Initially, the jaw is too small for a full set of adult teeth. Baby teeth serve their purpose just till the jaw develops enough room for adult teeth to form and push them out. This usually begins by age 6 or 7. Why worry about cavities in baby teeth? While baby teeth may seem temporary and dispensable, they actually play an important role that can impact the development of adult teeth. They act as a guide that adult teeth follow to emerge properly positioned, and a badly decayed baby tooth can even transfer the disease to the adult tooth below. That’s why it’s crucial to develop positive dental habits in early childhood, ensuring a solid foundation for oral health. When and how do baby teeth fall out? Baby teeth begin to feel the pressure as soon as an adult tooth is fully formed below it, usually beginning by age 6 or 7. 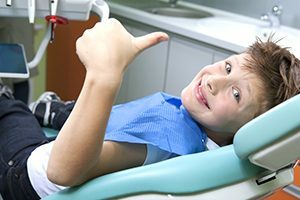 Starting with the incisors (front teeth) and working back, each tooth is lost and replaced until the process is complete by age 10 or 12 (when the 2nd molars are lost). Baby teeth are effectively pressed out by the adult teeth, which cause the baby-tooth roots to dissolve. What to do about a loose baby tooth? Ideally, nothing! A loose tooth will fall out on its own or (since they are the only ones who truly know how loose it is) the child will pull it out themselves. But, if it’s really wiggling and needs to be removed, grip it firmly with a clean handkerchief and rock it out gently.